There are several countries that for one reason or another are only bordered by one other country. 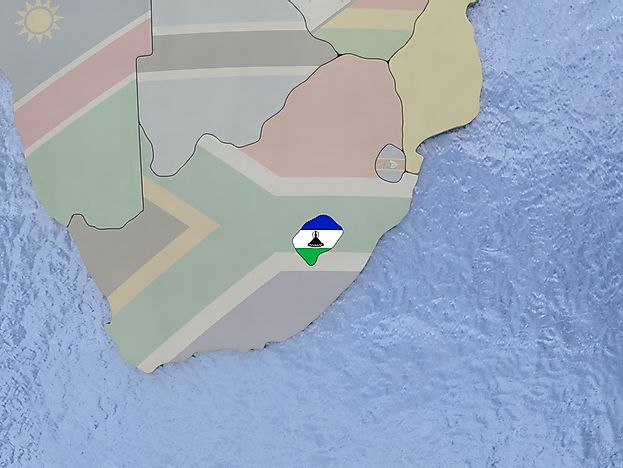 The small African nation of Lesotho is entirely surrounded by South Africa. There are numerous nations which are bordered by only one state, and in most cases, these countries have other neighbors across the oceans and seas, but they have one the land boundary. There are only three arrangements by which a nation can have only one border. The first one is a peninsular relationship whereby the first state shares a boundary with the second, and the sea surrounds it while other nations border the second one. The second option is when a country is landlocked and surrounded completely by another one like in the case of South Africa which surrounds Lesotho and Italy which surrounds the Vatican. The last possibility is in the case of a divided island like the United Kingdom and Ireland or the Dominican Republic and Haiti. Canada is a sovereign nation on the northern sides of North America. Canada has ten provinces plus three territories which stretch from the Pacific to the Atlantic and into the Arctic Ocean on the north. It occupies an area of about 3.85 million square miles, thus making it the second largest nation in the world by total area. The Canada-United States border is the longest bi-national land border in the world, and their border is approximately 5,526 miles long. Tundra and forest dominate a majority of the Canadian land. Some indigenous people inhabited Canada for thousands of years before colonization. The French and the British established colonies in this region during the 16th centuries with the French forming the Canada colony in 1535. The British gained control during the late 18th century. The colonies of Canada, New Brunswick, Nova Scotia and Canada were federated to form a federal dominion called Canada on July 1, 1867. Canada is a constitutional monarchy and a federal parliamentary democracy with the head of state being the British monarch. Portugal is a sovereign state which is bordered by the Atlantic Ocean and Spain to the east and north. It is in mainland Europe, and it has only one land neighbor. The current Portugal Spain border, also known as A Raia in Portuguese and ‘a Raya in Spanish is as it was defined in the treaty of Alcanices in 1297. The 754-mile long border is one of the oldest boundaries in the world, although it is not defined for about 11 miles between Ribeira de Cuncos and Caia River due to the dispute over Olivenza. Portugal has two autonomous territories which have their governments (Madeira and Azores). Mainland Portugal is split by the Tagus which flows into the Tagus Estuary from Spain. It is one of the oldest nations in Europe and the oldest in the Iberian Peninsula. During the 15th and 16th centuries, Portugal was the world’s dominant military, political and economic power. Lesotho is an enclaved nation which is about 11,587 sq mi in size. Lesotho is a landlocked nation which is surrounded by South Africa. Lesotho, previously called Basutoland, gained its independence from Britain on October 4, 1966. It is the only independent nation on earth which lies above 3,281ft in elevation, in fact over 80% of the country lies above 5,906ft, thus making it the highest in the world. The government of Lesotho is a constitutional or parliamentary monarch with the prime minister serving as the head of the government. The King of Lesotho does not have any executive authority and is prohibited from participating in politics. The longest boundary in the world is the United States-Canada boundary which is about 5,526 miles long of which 1,538 miles is the Canadian border with Alaska. Thirteen American states (Idaho, Maine, Ohio, New Hampshire, Vermont, Pennsylvania, New York, Minnesota, Michigan, North Dakota , Montana, Washington and Alaska) and eight Canadian provinces (Yukon, Saskatchewan, Ontario, New Brunswick, Quebec , Manitoba, Alberta, and British Colombia) are on the Canada-United States border. The boundary was first agreed upon during the signing of the Treaty of Paris in 1783. The agreed-upon border included the line from the northwestern most head of River Connecticut to Nova Scotia. The St Lawrence River and the Great Lakes became the boundary between the present day the United States and Ontario. An International Boundary Commission was formed in 1925 to help deal any boundary issues which might arise.